I arrived at Fisheating Creek Hunting Camp, Palmdale, Florida, just south of Lake Okeechobee at 16:30, Thursday, 03/07/2002 for a three day Osceola Turkey hunting trip. 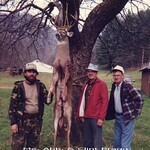 There were 2 hunters from Miami Beach and another from Miami as well as a father and his 9 year old son from Boston. David Austin was guiding for me. David worked for the Florida DNR for over 30 years and is very knowledgeable about Florida wildlife in general and turkeys in particular. I learn something new every year I have hunted The Creek. Friday morning dawned very foggy and damp. We went to Cow Bone Gully and I used the Thanks Giving call to fire up 5 gobblers but couldn’t get any to come in. Finally, we decided to move on 1 bird. I called from 3 different spots, getting closer each time, and got within 50-55 yards of him. He was henned-up and wouldn’t come in. There was plenty of cover and David figured I could get about 20 yards closer and possibly get a shot. He helped me remove my vest and I literally got down on all 4s and took about 15 minutes to cover the 20 yards. I stood up behind a large oak cluster and saw only hens. I waited about 10 minutes and, when the hens had moved off a little ways, dropped down and moved 5 yards closer. I was behind a huge blow down with a lot of tall palmettos growing through it. I still saw only hens. I dropped down and moved about 5 yards to my right. The blow down had 2 large trunks creating a ‘V’ and I couldn’t see over the top one. There was about 3 feet between the top and bottom trunk so I crouched down and looked through to see 3 huge, white, snowballs about 30-35 yards away. It was obvious which bird was the boss, he kept strutting and gobbling but would not separate from the other gobblers. It took about 10 more minutes for the boss to move away from the other 2, gobble, stick his head up, and take a load of Remington 12 gauge duplex 4x6 shot to the head from my Remington 11-87 NWTF 25th Anniversary shotgun. This great turkey was harvested at 08:10 A.M. on 03/08/2002. He weighed 20.03 pounds, huge for Florida, with a 9” beard. His left spur taped 1 ¼” and his right 1 1/8”. The fact that I was able to stalk up on at least 9 pair of turkey eyes and not flush the birds is what I am most proud of. I’ve tried it before and always managed to flush the birds. One of the hunters from Miami killed a nice gobbler and the father and son team each killed a bird at almost the same instant. The 9 year old killed a jake and his father a gobbler that had trailed in after the jake. The shots were almost simultaneous. I also killed a 170-pound wild hog that evening at 18:30 from 23 yards. It was a deep, red, dry sow. Good read George. Thanks fer sharing. Brought back my memories of gettin my Osceola. OLE RASPY wrote: Good read George. Thanks fer sharing. Brought back my memories of gettin my Osceola. Thx. On the days when it's just too damned cold to get out like today @7 with the WC below 0, I like to go back & re-read my experiences. We need pictures for this one too.